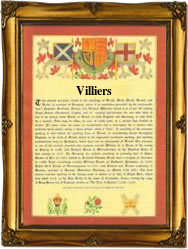 Recorded in several spelling forms including Villar, Viller, Villier, and the patronymics, Villiers, Villars, Villers, and Villis, this famous and noble surname is English, but of pre 10th century French origins. Introduced into England by close followers of Duke William of Normandy, at the Invasion of 1066, it has at various times been one of the most powerful surnames in the world. It is the surname of the Dukes of Buckingham, who held great power and influence under the Stuart monarchs, and also the Earls of Clarenden and Jersey. No less than sixteen coats of arms have been granted to nameholders in England. The name is locational and originates from the various places called Villier or Villiers in France, including for example, Villiers-le-Sec in Calvados, Normandy. The derivation is from the Roman (Latin) word 'villare' meaning an outlying farm or dependent settlement, and cognate with surname of Norse-Viking origins Thorp or Thorpe, or the Olde English Worth. Early examples of the surname recording include William de Viliers in the register of the Knights Templar of Yorkshire in 1185, and Nicholas de Vylars of Sussex in 1327. Throughout the centuries surnames in every country have continued to "develop", often leading to astonishing variants of the original spelling.